If you have atherosclerosis, you’ll get the care you need at Lehigh Valley Health Network’s Heart and Vascular Center. Atherosclerosis treatment includes the modification of risk factors. We’ll help you quit smoking, lower your cholesterol and blood pressure, manage diabetes, exercise and eat right. Medication also is used to treat atherosclerosis. If you suffer a heart attack caused by blocked arteries, we consistently rank in the top 1 percent in the nation for heart attack survival according to U.S. Centers for Medicare and Medicaid Services "Hospital Compare" data. Our fast heart attack care program, MI Alert for Heart Attacks, saves lives. It consistently opens the arteries of people suffering from a heart attack in less than 90 minutes, the “gold standard” for heart attack care. 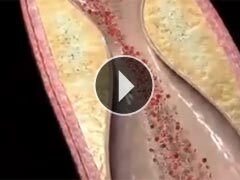 Angioplasty is an important part of our award-winning, fast-action heart attack program, MI Alert for Heart Attacks. We educated local paramedics to diagnose a heart attack in the field and communicate their findings to our doctors. This allows us to prepare for a lifesaving angioplasty while the patient is on the way to the hospital, saving precious minutes. Our MI Alert for Heart Attacks program consistently opens the blocked arteries of people having a heart attack in less than 90 minutes, the “gold standard” for heart attack care. It's one reason Lehigh Valley Hospital consistently ranks in the top 1 percent in the nation for heart attack survival according to the U.S. Centers for Medicare and Medicaid Services data. If you need heart bypass surgery, you’re in skilled, experienced hands at Lehigh Valley Health Network. Our board-certified cardiothoracic surgeons perform more than 1,750 surgeries each year, among the most in Pennsylvania. Because we care for such a large number of people, our doctors have the experience needed to achieve excellent results, which are consistently among the best in Pennsylvania. Surgeons are assisted by nurses and support staff who specialize in heart care. This team of specialists uses the latest devices and techniques to help you feel better faster. Antiplatelet medications decrease the ability of platelets in the blood to stick together and cause clots. Anticoagulants, also described as "blood thinners," work differently than antiplatelet medications to decrease the ability of the blood to clot. Antihyperlipidemics lower lipids (fats) in the blood, particularly low density lipid (LDL) cholesterol. Statins are a group of antihyperlipidemic medication.